Poorly run gaming forums haunted by unsavory individuals do stuff like this. Social media has largely replaced the venerable forum and even older mailing list. I've largely been out of the 40K scene especially that of the obsessively competive and pathetically juvenile bragadoccios. I did build a miniature painting news aggregator. I basically gave up all my hobbies in pursuit of the CFA® Charter. 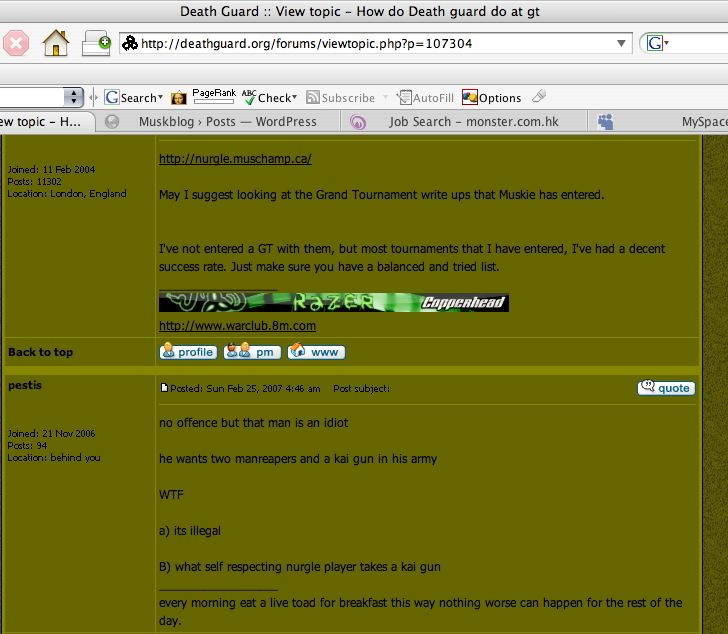 Some people may be aware of another Nurgle website which did have a forum. They appear to have disappeared off the Internet, paying for webhosting bills for decades is no joke, especially when you are unable to secure that often promissed high paying job. I didn't have a high opinion of that place. It could be because every few months some person I've never met sees fit to insult me. It isn't even one person. They don't know me. They aren't winning any friends, and now they're being mocked on the Internet in perpetuity. Congratulations. For the record my proposed third GT army has zero manreapers in it. I have two reaper autocannons which is both legal and the only way a troop with the mark of nurgle can get a gun that shoots over 24 inches. Being able to shoot over 24 inches is a good thing, especially being able to move and shoot over 24 inches. It is obvious that pestis and Morbo have difficulty with the English language. The latter can't even spell the only word in his one word post. Can I get anyone to "Seconed" that? Although it seems to have suffered an exodus due to people getting older, finding new hobbies, and the rise of alternatives, I'm still a fan of the original 40K mailing list. This is where I historically posted my website updates. If you still feel the need for interactivness and good old fashioned email is too passé for you, I have recently put up a miniature painting blog, which I suppose I could do more to promote.